Gaming laptops are a funny business, aren’t they? Nine times out of ten they’re nowhere near as powerful as an equivalent desktop PC, yet they usually cost just as much, if not more, than the bulky black rectangles they’re so desperately trying to replace. There’s also a matter of looks. 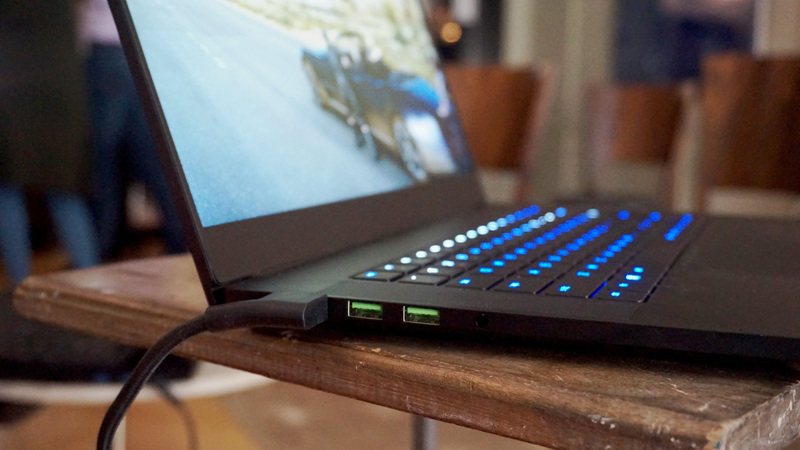 Most gaming laptops are very much from the shouty GAMING LAPTOP school of design with their edgy angles and flashing LEDs, not to mention the fact that most of them would likely break your back as soon as you tried to remove it from your desk. 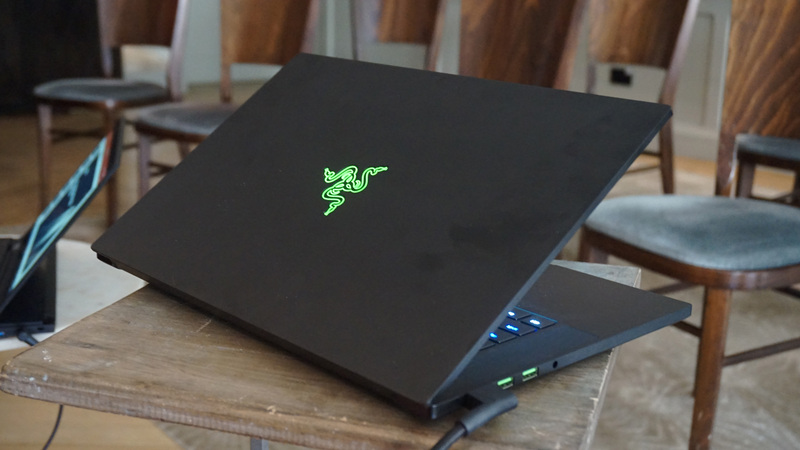 Razer’s gaming laptops, on the other hand, have always tended to hark back to the nice slim portable laptops many of us, myself included, use for work – and their new, rather lovely 15.6in Razer Blade that I went to see a couple of weeks ago, complete with its 144Hz refresh rate and one of Nvidia’s GeForce GTX 1070 Max-Q chips, could well be one of their best yet. Let’s take a look. 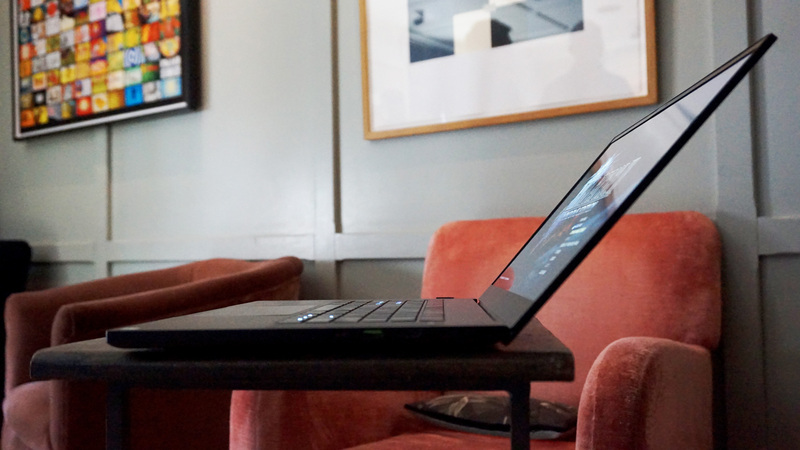 Measuring a mere 17.3mm thick, the new Razer Blade is only a little fatter (2.2mm, to be precise) than a 15.6in Macbook Pro. At 2.1kg, it’s also light enough that you can hold it in one hand without breaking every bone in your wrist, and – Razer’s obsession with green snakes aside – wouldn’t be something I’d be embarrassed to get out of my bag at an airport, for example, when my wholly theoretical 7.45am flight that I got up at 4am for has been delayed by several hours and there’s a spare plug socket going free in the departure lounge (no, really, I’m currently stuck at an airport and don’t want to ruin the battery life on my Switch before I’ve even left the country). And when its combination of a six-core Intel Core i7-8750H processor and Nvidia GTX 1070 Max-Q chip (Max-Q being the more energy efficient variant of Nvidia’s mobile graphics family) can run the graphical behemoth that is Final Fantasy XV at 1920×1080 on High at a decent, not to mention steady, 30fps, that’s exactly the kind of thing I want from a nice portable gaming laptop when I’m running on two hours sleep and stuck in the infernal depths of hell that is Gatwick’s South Terminal. All right, so a game like Final Fantasy XV probably isn’t going to be taking advantage of the Blade’s 144Hz refresh rate, but at least it’s one of the prettier laptop displays I’ve seen in some time – at least compared to other gaming laptops I’ve tested recently like the Dell Alienware 13 and HP Omen X 17. I’ll have to wait until review samples are available before I can start testing things like colour accuracy and contrast ratio, of course, but with a claimed 100% coverage of the sRGB colour gamut, colours certainly looked rich and punchy at first glance, and the Blade’s super slim 4.9mm bezels make it feel like you’re getting a lot of screen real estate for the size of the laptop. 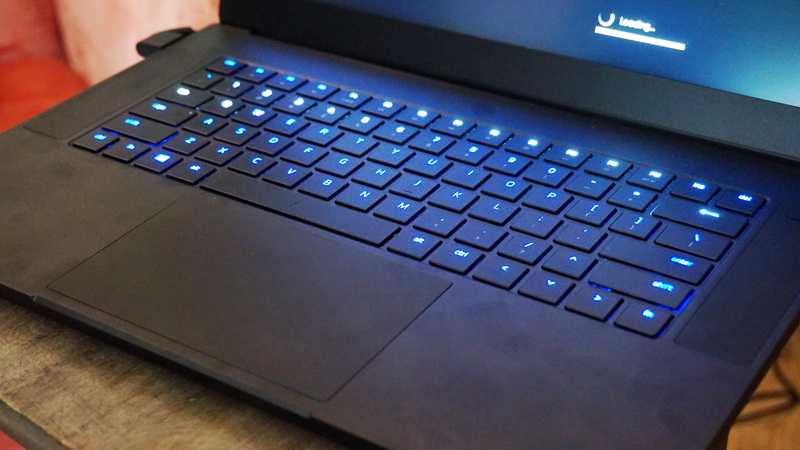 The chiclet-style keyboard will also please RGB fans, as it will not only flash all manner of colours when the laptop is left idle (or waiting for a cutscene to play out), but it will also instantly switch to game-specific lighting schemes when you start playing a game. In Final Fantasy XV, for example, only the WASD, E and arrow keys were lit, making it easy to hone in on the key bindings you actually need rather than floundering in a sea of useless letters when, and this is purely hypothetical of course, most of your muscle memory has either been confined to a controller in previous gaming sessions, or the number of screaming beach-crazed children running excitedly around your feet has left you incapable of remembering which key does what. You get a huge touchpad as well, which is almost as deep as the keyboard itself, and four USB ports around the sides. Its small size means there’s not a lot else in terms of connectivity options – a combined 3.5mm headphone and microphone jack is more or less your lot – so it’s not exactly great for connecting to an external display, but I guess that’s the price you pay for getting a slimmer laptop as opposed to a 17in tank masquerading as a large brick. It shouldn’t, in theory, cause too much of a racket either. With a noise rating of just 40dBa, you’ll notice a certain amount of whirring when you’re sitting in front of it, for sure, but at least it shouldn’t be too annoying for your equally irate neighbours who probably also got up at 4am, because that seems to be the only time anyone ever goes to the airport. Unfortunately, there weren’t any other games for me to try during my demo session with the new Razer Blade, which makes it a bit difficult to judge how it will handle other titles. Still, Final Fantasy XV is arguably one of the toughest games out there right now, so if it can handle that at 30fps on High, I’d imagine it would be pretty capable of holding its own against today’s other AAA games. There is, of course, the small matter of pricing. Only the GTX 1070 Full HD version is available at the moment on Razer’s Store, and that one will set you back a massive $2400. Two other GTX 1060 models as well as a 4K GTX 1070 version are due to arrive in June with prices starting at a vaguely more palatable $1900, but that’s still a heck of a lot of money. Still, first impressions are certainly high and the prospect of playing Final Fantasy XV on the go at a decent frame rate is absolutely an enticing one – at least for JRPG nuts like myself – and I hope to be putting one through its paces very soon, once I get out of this damned departure lounge.